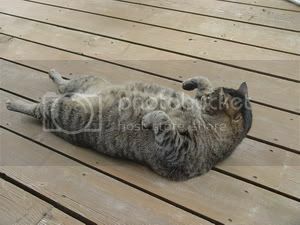 Once your cat has been diagnosed with feline diabetes, you may be asking yourself "How much is this going to cost me?" In our experience, we had Kitty at the vets for a day. As he needs to be sedated before he even gets out of the carrier (did I metion he is an incredibly BIG cat? ), we usually leave him there all day and pick him up after work. Our vet did a full blood workup, urinalysis and physical. It was approximately $350.00, which included keeping him there all day and the sedation. The special diet that he was given was about $20.00 per bag (lasts about 3 weeks). Our original insulin was about $7.00/bottle and the syringes were about $20.00. Doing glucose curves at the vets is far more expensive than doing them yourself (more on glucose curves at a later date). Our old vet charged about $100.00. For us to do it at home, we purchased the test strips. We got a deal that if you bought 100 test strips, the glucometer was free, so it was $85.00 to do 100 tests. These strips last about a month to a month and a half, depending on how often you are testing. 2) You do not necessarily need to feed a prescription diet. We will talk about diets later and will give some suggestions on good food for your diabetic. 3) See if you can purchase syringes at the pharmacy rather than at the vets. The pharmacy syringes are much cheaper. Make sure that they are appropriate for the type of insulin you are using. Different syringes are made for different types of insulin. Once you are more experienced, you can do a simple conversion to use other syringes but in early days, it is best to stay with the recommended syringes. As you can see, feline diabetes isn't cheap to treat, but there are a few things you can do to help defray costs.